Wow, what a weekend. I didn’t think that we would fit it all in, or that we’d have the energy for it, but we did. Three days, three resorts. When we left Florida at 4AM on Saturday it was in was in the low 60s, but when we arrived in Boone it was around 20 with a wind chill below zero. 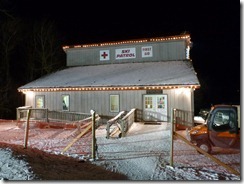 If the conditions are good, the 6-midnight special at App is an awesome deal; six hours of skiing for only $30. And this particular day, the conditions were awesome. There was fresh powder on the slopes and by 8PM, it was a complete white-out from the falling snow. I estimate that 1 1/2 to 2” fell while we were there. Add this to the fresh stuff from the snow guns after 10PM, and it was an awesome night. App does not have a lot of terrain, but where is lacks there you gain in lift turn around. I lost track how many times we went down Orchard Run. After a late night at App, I schedule a late start the next day. After waking up, we raided the hotel’s breakfast then relaxed a couple hours before heading out. Before hitting Sugar, we calorie’d up at Wendy’s so that we wouldn’t burn out half way through the day. We arrived at Sugar at about 1:30, and had to park in, literally, the furthest spot from the resort. I could spit on Tynecastle Highway from the the car. After the shuttle bus ride to the resort, we picked up our lift tickets and hurried to the lift….to wait. I’ve never seen so many people at Sugar! We waited for 45 minutes to get on the first lift. Needless to say, we made full use of the cutoff and mid loading lifts the rest of the day. We truly were able to enjoy all of the runs at Sugar. Temperatures were frigid and every run was open. Brandon and I really enjoyed the Big Red run. It was a great place for him to practice connecting his toe and heal side turns. Because we bought the twilight tickets, there was a hour and a half break at 4:30 to groom the slopes. We took advantage of the rest and grabbed some food at the cafeteria. While the price was a little high, their BBQ sandwich is awesome. I highly recommend it. Sometime during the evening, someone ran over the tail of Brandon’s board and broke it. While it was still useable, we’ll be replacing it before next year. At 6PM the slopes opened back up. Brandon and I headed back up to Big Red and began connecting it to the summit. Doug and Dan kept cycling up to the summit going down Northridge to the Flying Mile. Brandon and I never saw Doug or Dan on the lifts, so I figured we must be chasing each other. So we rode back up a different pattern to line up, to no avail. So I told Brandon we should head down to the lodge and find them. We had walkie talkies, but with the numerous layers of ear protection and the snow guns running we couldn’t hear them. I headed down to get my car, while he and Brandon headed to ski patrol. It turns out that two firefighters saw him on the mountain. 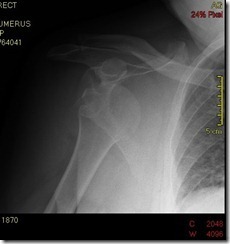 They quickly diagnosed his shoulder and called ski patrol. We learned from the ski patrol that his $30 craigslist skis were outlawed about 15 years ago, but we kept them as a souvenir. Let me say this…the Watuga Medical Center has BY FAR the nicest emergency room I’ve ever been in. 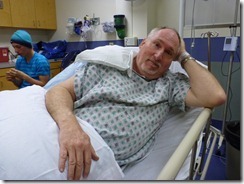 Dan was in and triaged within minutes. Their vending machine even had Butterfinger Cappuccino, how cool is that? After xrays confirmed it was truly a displacement, they drugged him up and popped it back. He was released at about 11:30PM, but needless to say, his skiing weekend had officially ended. Dan’s “little” injury wasn’t slowing the rest of us down. 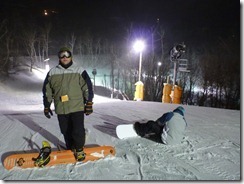 After another great breakfast at Holiday Inn Express, Dan decided to join us at Beech Mountain…he would just skip the slopes. What a difference a day makes. The day before at Sugar it was below freezing with a below zero wind chill. At Beech is was 40+ degrees with a crystal clear ski. Beech was 100% open, including the Oz run off of the peak. This was our first time on Oz, and we all now call it our favorite run at Beech. Now the lift…that’s another story. Doug and the Oz lift just didn’t get along. Almost every time we used it, we stopped it. Twice Doug needed assistance from the operators. For lunch we hit up the Beech snack bar. I highly recommend their homemade chili. Around 2:30 our bodies were sending up smoke signals to our brains that it had about had it. Brandon and I headed up for a couple more runs down Lower Shawneehaw, but I’d become so tired I couldn’t buckle my bindings without sitting and when I began to loose my balance, I’d just bail. I didn’t have the energy to fight it. We ended the weekend without any further injuries, and celebrated with dinner at Blackcat Burrito in downtown Boone. Tuesday morning we headed out at 4AM and just beat the snow and sleet that was rolling into the area. Within 2 hours of us leaving, Watuga County closed schools and some roads. 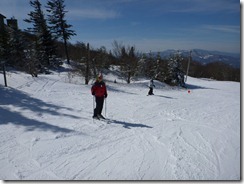 I was truly doubtful that we’d have had the energy to ski three resorts. Especially, midnight madness after a 11 hour drive. But we did it and it was a blast. We really missed Trevor on this trip, but he decided to sacrifice this trip to save his legs for track season, and for that I’m proud of him. Will we do it again..HELL YEAH. But next year, the other Drummond boys and my wimpy friends are coming.